During our stay at Junction we have found out that one of the biggest issues in the IT and the Legal industries is the proper, accurate and reliable estimation for project time and budget. We decided to tackle this challenge and to find a solution for this interdisciplinary issue. Our software utilizes machine learning algorithm to estimate projects' time consumption. Our proposal can be integrated into Castrén & Snellman's current CRM system. Using this approach, time spent on project resource and budget estimation can be reduced to the matter of seconds. 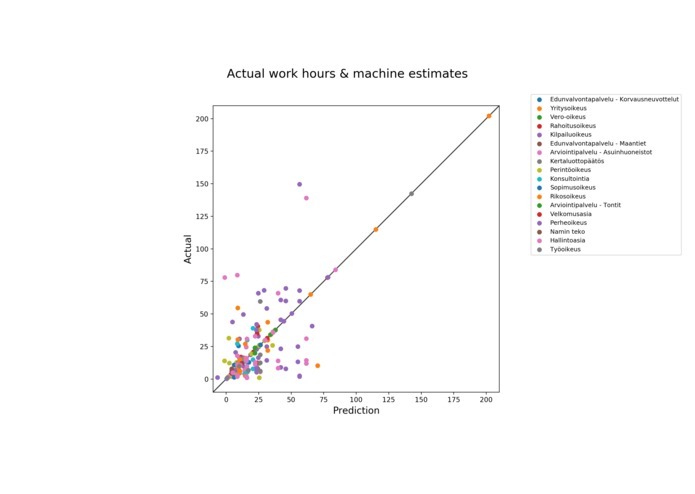 We used dataset provided by CSI as an input to our Machine Learning algorithm. Multiple regression predictors were tried on the data, out of which the Artificial Neural Networks and Random Forests proven to be the most robust. The classifiers can estimate required resources for previously unseen projects from a few set of features already based on the prior data. 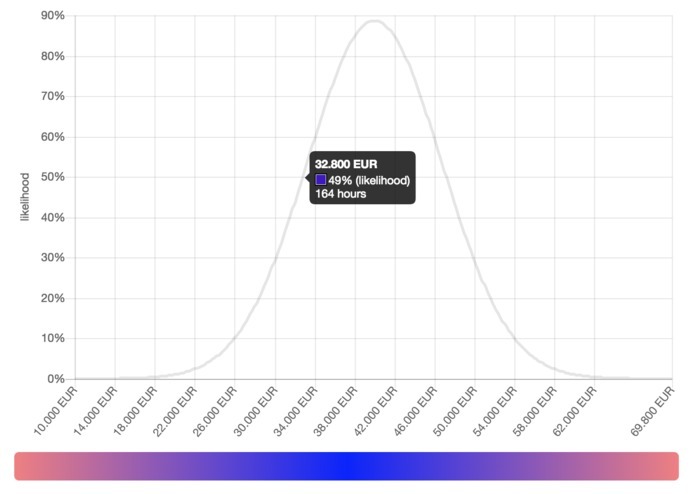 To make the output easy to understand, an intuitive visualization of the estimation was created, that could be part of the current system in use. The provided dataset is not completely representative, which makes the predictions more difficult. It would be interesting to see how the trained models perform on real data and how the results improve in a real environment. We have trained multiple regression predictors, such as Linear Regression, Polynomial Regression, Support Vector Machines, Artificial Neural Networks and Random Forests. We have created an intuitive visualization which is easy to interpret by end-users and project managers. We believe that our proposal towards approaching project time and budget estimation is scalable to other domains as well, such as ICT, construction among many others. The most important takeaway from the project is that time-estimation is not a legal domain specific issue. Our approach proves the relevance of applying computational methods in this area, which can take large amount of time and resources from project manager's shoulders. Last but not least, we have learned a lot about billing, especially from business' law firm’s point of view. It would be really interesting to see how this algorithm works with a real data. At the same time, our aim is to further improve the accuracy of the already well-performing algorithm. We are open and aiming for further collaboration with Castren & Snellman? I have built the Machine Learning algorithm based on the domain knowledge gathered by from the lawyers in our team. I have contributed to developing the idea on a conceptual level and made our submission to devpost. I gathered information about business law firm’s current price estimation process of legal cases as much as possible. I helped to create lawyer-friendly interface for our front-end solution. I presented the first part of our pitch which explained practical side of our idea. I gathered information on how business law firms do their price estimations for legal cases and helped with creating a lawyer-friendly interface for our front-end solution.